We will NOT be selling water bottles at this event as an effort to protect our environment. "Finlay Kuester is a theatre student in Ashland, Oregon and an Oakton HS Alumnus. 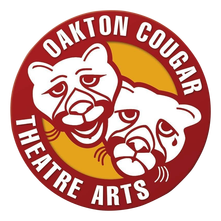 During his time at Oakton, he stage managed, 21 Chump Street, Almost Maine, and Titanic The Musical. He is currently pursuing a BFA in Stage Management at Southern Oregon University and working on original projects, including his first play, Who is Angelo. He would like to thank Mrs. Vanessa Gelinas for keeping him on the right path."